Workers at the site of the pedestrian bridge collapse near Sandton over the M1. BREAKING: A temporary pedestrian bridge over a main route in South Africa has collapsed, killing at least two people and injuring 20. 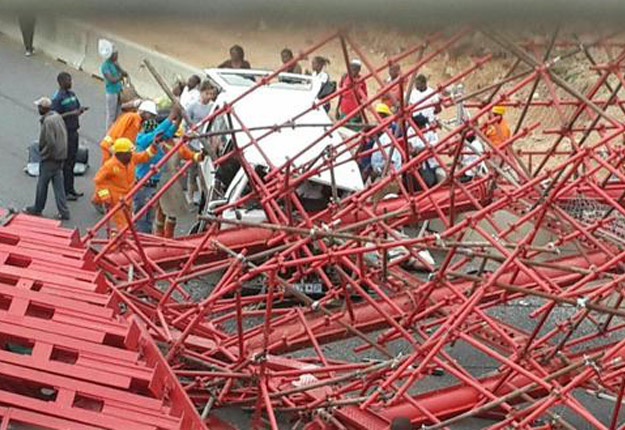 “The bridge collapsed onto the main highway between Johannesburg and the capital, Pretoria, during rush-hour. The accident happened near a busy slip road to the Sandton financial district. Emergency services were still attempting to reach some of those trapped, late on Wednesday afternoon. The pedestrian bridge crosses the M1 highway. Read more and watch video of news reports at BBC Africa.